I’ve shared income reports in the past and have decided to (hopefully) start sharing them again regularly. I like doing so for several reasons. The most important reason is that I do like to be transparent with our readers that I do put a lot of time into this website as a full-time job to earn an income from. Second is that I have learned a lot about blogging through the years by reading what other bloggers share and I’d like to share my experiences as well. This also helps me look back at past months and see trends, growth, and what could use improvement. Plus, it helps me stay on top of accounting better. 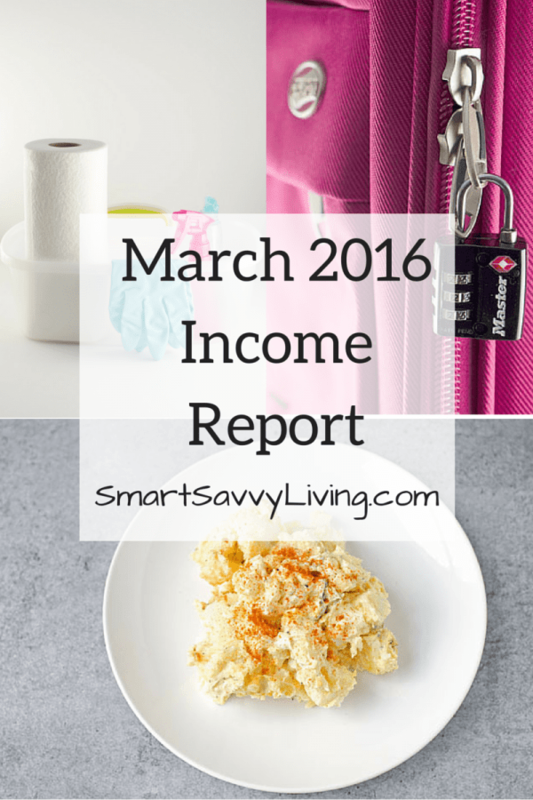 Let’s dive into the numbers of our March 2016 income report. This is income that is directly made by this website alone. You can sometimes get other gigs from owning a blog, such as freelancing on other sites, but I am not including income like that here. I also don’t include things like products I got to review, but this is something you still have to claim as income on your taxes. It is also important to know that just because I earned the money this month, it doesn’t mean the money made it into my bank account this month. Some networks pay as soon as Net 30 (meaning 30 days after the end of the month you earned the money in), while others have paid as long as Net 120. This includes anything that I wrote for brands or services including sponsored blog posts or sponsored social media posts. IZEA – $860 – I’ve been using IZEA for years (it was once known as SocialSpark) and they have consistently been one of my biggest income makers. I mainly get sponsored posts and tweets through them. I know some other bloggers don’t get much work with them, but I regularly do and they are one of the easier networks to work with. I do recommend signing up for their Pro plan that is $5 a month. I usually wouldn’t pay to use a site like this, but I more than make my money back with it each month as it helps get your site in front of more brands. The Motherhood – $325 – I don’t get work too often through The Motherhood, as we only have fur kids. But when I do, it does pay fairly well. Best Buy Blogger Network – $150 – Even though the pay isn’t the highest, the Best Buy Blogger Network is one of my favorite networks to work with. I love talking about tech and learning about new appliances. Plus, sometimes you also get cool tech products to try out and write about. They do only pay in Best Buy gift cards, but that is A-OK with me. One 2 One Network – $50 – This is another network I rarely get work from, but they offer the usual sponsored posts, reviews, and social media posts. Activate by Bloglovin’ – $34.65 – This network was recently known as Sverve. I’ve never gotten a sponsored post from them, but I do regularly see sponsored tweets pop up which just require a couple of clicks. I probably should have waited to start posting income reports again until next month because I changed the way I implement ads on Smart Savvy Living at the end of March. For a few years now I had been managing my own waterfall, which is basically having several ad networks tied together so that the highest paying ad will load first, of ads anchored by Mode Media. It was a lot of work and some of the networks just didn’t pay well enough for the amount of time it took and their exclusivity requirements. It also made my site sooo slow. I had been hoping to eventually join Adthrive, which requires 100k pageviews, but they have a waitlist and I had trouble meeting 100k pageviews each and every month. Then, I heard about Mediavine after seeing it on several of the food blogs I read from time to time and saw it mentioned it a couple other blog income reports, too. So far, they have been really great work with. I contacted with my first inquiry on March 16 and had my ads going by March 28. Mediavine has great communication through email, a Facebook group and a Google group, plus they are very quick to respond to any emails and their groups as well. They also seem to be quite open about their practices and what’s going on, which is something I especially appreciate because I’ve honestly never seen another company do that before. Anyway, here’s my ad income for March. This includes banner (image) ads that you’ll find on the sidebar or within our content. Pad Squad (responsible for all mobile ads) – $238.04 – Pad Squad handles our mobile theme and all of its ads, making it super fast and efficient. It is important to note that while I currently use both Pad Squad and Mediavine, you can no longer use both together if you sign up as a new member. Sovrn (used through 3/27) – $72.94 – I’ve always really liked Sovrn as my RPM with them has been quite decent compared to other networks, no matter if the ads are above or below the fold. Google Adsense (used through 3/27) – $27.14 – Google Adsense is a great starter network and many larger bloggers still keep it in their ad rotation or waterfall. It doesn’t have the requirements like some other networks do. Mediavine (used 3/28 – 3/31) – $11.30 – As I mentioned above, this is a new network I’m just getting started with, but so far I’m really happy with them. Gourmet Ads (used through 3/27) – $5.67 – This is one of the last ad networks in my waterfall. They have an ad fill that’s pretty much 100%, but my CPM with them is pretty low. Some may have better luck with them. As far as I know, they are only available to food bloggers or bloggers that regularly post about food, like us. This income comes from text links or images included within content that includes a special link to sites I partner with. If a reader purchases through these links, at no extra cost to them, you earn a small commission fee. ShareASale – $26.25 – ShareASale isn’t one of the largest affiliate networks but they do have several companies and brands to work with. Once nice thing about this network is that some brands will offer small bonuses (think $5 – 25) to post about them or their special sales whether or not you get any sales. Amazon – $24.65 – Amazon is one of the best affiliate programs to use in my opinion, and I have grown to try to include at least one link to there in every non sponsored post I write. One nice thing about Amazon is that since they sell such a nice variety of items, even if someone doesn’t purchase what you linked to, they just might see something else they want to buy that you get credit for. One thing that’s important to remember when you’re a blogger is that you’re self-employed. This means you’ll be responsible for paying for many things you wouldn’t in a traditional job. In addition to all the expenses you see here, I’m also responsible for paying things like taxes, health insurance, retirement, and products I use on my site, like recipe ingredients, that I don’t include in this income report. Food Blogger Pro (Yearly fee divided by 12) – $18.75 – I honestly normally wouldn’t think of spending this much a month on a how-to service. But, they do such a great job of providing information for every level of blogging from food photography to SEO that totally makes it worth it. Registration is currently closed, but will likely be opened up soon (supposedly the end of May 2016) and you can sign up for the wait-list. Tailwind App – (Yearly fee divided by 12) – $10 – Pinterest is a big traffic source for sites like mine that feature recipes, how-to’s, etc. The more you interact with Pinterest, the more return you usually see in traffic to your site. It’s hard to be able to do so in real time every day, so I like using Tailwind to schedule pins to go out throughout the day. You also get to see some neat analytics about how your pins and boards are doing. Microsoft Office & Email Hosting – $12.50 – Even though I have a Gmail address for Smart Savvy Living, I also like to have a domain email address as it easily proves you own the domain in correspondence, plus you’ll have various people email you at your domain from time to time. I also use programs like Microsoft Word daily for notes and drafts. PicMonkey – $4.99 – PicMonkey is a great solution to use for making graphics, printables, and even editing your photographs. In my opinion, it’s especially great for beginners and is much easier to use than Photoshop if you’re not quite sure how to use it. Plus, you can use it on any computer with an internet connection. Mad Mimi Newsletter Service – $16 – I really keep meaning to take the time to make custom newsletters, but in the meantime, I find Mad Mimi to totally be worth the cost for easy-to-use automated daily newsletters. Synthesis Website Hosting – $47 – I really don’t need this level of web hosting, but in the long run I find it to be worth it. I’ve used shared hosting in the past and it was just slow, slow, slow and you never knew when someone on your server cluster would bring everyone else’s site offline. Now my site is pretty darn quick to load and have very little, if any most months, downtime. Wisestamp Lifetime Account (Custom Email Signature) – $25 This was a one-time fee special through AppSumo. I recommend signing up for their newsletter as they regularly have some awesome special sales such as this. For example, WiseStamp is usually $48 a year! With WiseStamp you can make cute custom email signatures with things like your website link, social media profiles, etc. Buffer – $10 – Buffer is a service that helps me save time by allowing me to schedule posts to social media networks. I currently only use it for Twitter, but you can also use it for networks like Pinterest and Facebook. There’s also a free membership, but you are limited to the number of profiles you can use. MaxCDN – $9 – A CDN is basically a service that puts your site files like your theme css or images on cloud servers around the world so your site can load faster. It also helps your site use less of your host’s bandwidth, which can be an important factor as your traffic increases. ManageFilter – $12 – ManageFilter can be a bit overwhelming to use at first if you don’t know how to use it most efficiently. I purchased the eBook How to Grow on Twitter for Bloggers and it has been one of my best investments to date considering it’s only $10 and has helped me grow my Twitter account by thousands of followers. March and April tend to be my lowest months for income before things start picking up again for Summer and the holidays. This is pretty common considering that this industry depends a lot on advertisers, which usually spend the first quarter of the year preparing and allotting budgets. As I mentioned earlier, I made some changes this month as far as monetization through ads. I’ve been growing more disappointed with ads over the past couple of years. It’s a lot of work to keep up with your own waterfall to try to get the most income as possible, especially with the income I was getting. I will be interested in seeing how it goes with Mediavine moving forward, but so far I can say I am very happy. One thing I am really trying to work on this year is making more income from affiliate programs. I don’t mind writing sponsored posts at all and feel like I do a pretty good job at writing sponsored articles that contain real,honest, and helpful information. But, I would like to do less of them because I don’t want this site to appear like one big advertisement, and I’d rather write less sponsored posts a month and be able to charge more for the exclusivity. Plus, I would like to diversify my income more. I feel like making more affiliate sales is a great way to continue to grow the blog’s income and be able to write what I want. Right now I am trying to include at least one affiliate link in each non-sponsored post as I continue to see what kind of posts are best for sales. If you got this far, thanks so much for sticking through and reading. I hope to have April’s income report up soon considering I’m now getting this posted in May. If you have any questions you’d like me to cover in future reports, please feel free to leave a comment below letting me know. See you guys next time! 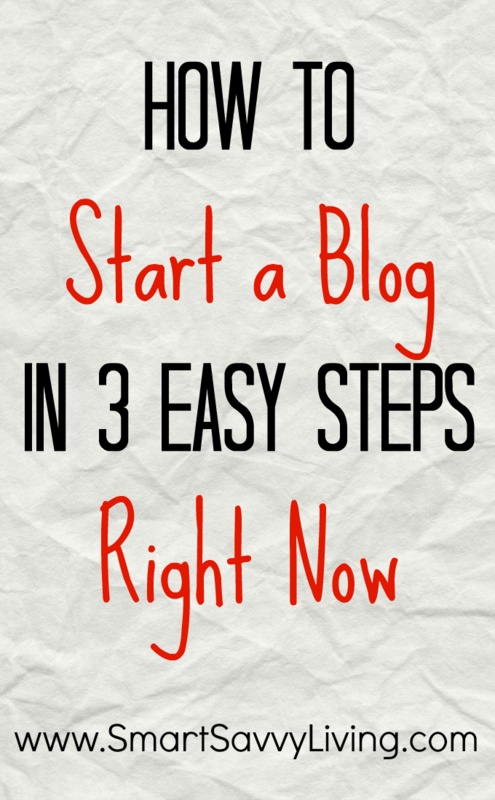 If you’re new to the blogging world and are curious about starting you own, I do have a how-to for easily creating your first blog even if you don’t know a lot about tech.